Savor Lentil Soup during cold months or year-round. 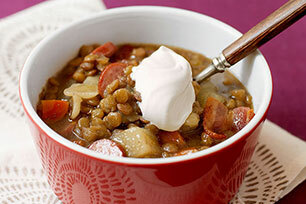 This lentil soup is made even heartier with the addition of bacon & thickly sliced OSCAR MAYER Wieners. Cook bacon and onions in large saucepan 8 to 10 min. or until bacon is crisp and onions are crisp-tender, stirring occasionally. Add garlic; cook 1 min. Add next 5 ingredients; stir. Bring to boil; simmer on low heat 25 to 30 min. or until lentils and vegetables are tender. Prepare using OSCAR MAYER Light Wieners, and BREAKSTONE'S Reduced Fat or KNUDSEN Light Sour Cream. Before cooking the lentils, place them in a colander and rinse them thoroughly. Discard any shriveled lentils or bits of dirt. Then, cook as directed. Soup can be prepared ahead of time. Cool, then pour into airtight container(s). Freeze up to 1 month. When ready to serve, transfer frozen block of soup to large saucepan; cover. Cook on low heat until thawed. Bring to boil on medium heat, then simmer on low heat 10 min. or until heated through, stirring occasionally.